you know how some people are “creative” or have “great intuition”, and others appear NOT to have those qualities? Creativity and Intuition are ‘skills’ anyone can develop! look at the same problem long and hard enough – usually from as many different perspectives and angles, and your mind will suddenly and ‘unexpectedly’ come up with solutions that make no ‘logical’ sense. Aka: creativity and intuition. Speaking from personal experience, I am extremely creative in some areas, and not creative at all in others. And those where I am, guess what: it’s the stuff where I spend ages, sometimes months, sometimes ‘lifelong learning’ revisiting the same thing over and over again. … however: Really, there’s nothing genius going on, just persistence. Your brain needs information, a LOT of information to come up with something ‘truly’ novel … despite the romantic image of Einstein just sitting there and suddenly THE BIG THEORY just came to him … it came to him, because he was so bored with his desk-job that he studied physics like a maniac – for YEARS. And kept looking at the same problem over, and over, and over, and over again. 6 pencils. Only the ends can touch. Meaning: no ‘crossing’. 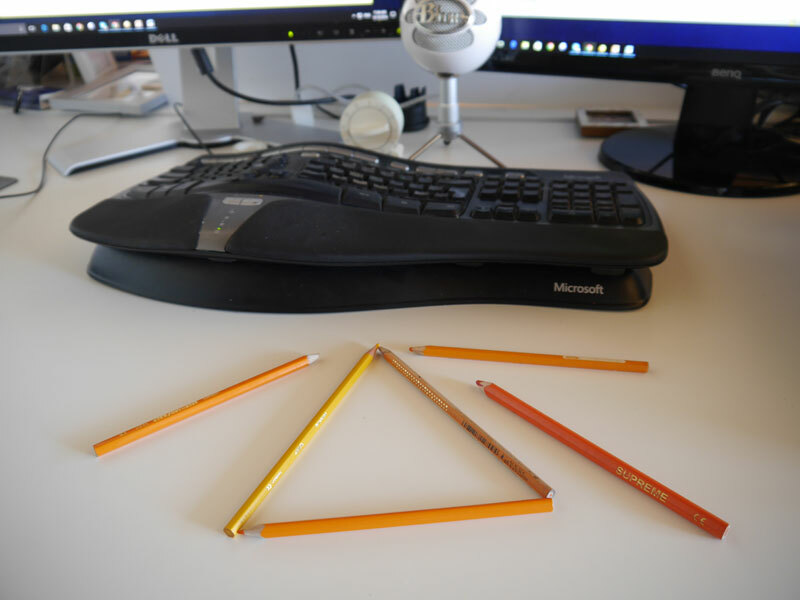 You must create 4 equal triangles. And that’s precisely where you starve future ‘creativity’ and ‘intuition’. Btw, when you figure it out (yes, it is possible!) it is immensely satisfying – and IMO it’s so satisfying precisely BECAUSE it’s a creative moment, and you only got there because you stuck with it! PS: (**) boo, bad Veit: now I’ve put the thought of ‘giving up’ in your head, and because statistically speaking most people give up, well, social psychology tells us your brain is going to tell you that it’s ok to give up. Well, most people in this world are mere statistics, give up far too early, and spend their lives admiring the bright shining stars. Don’t be a statistic! Figure out that darn 6-sticks-4-triangles thing yourself! As soon as I read you comment, Detlev, it jumped right up in front of me. Solved in seconds. However; it certainly would have been 5 minutes if I hadn’t read your comment. Arrgh, Deltev, you ruined it for me! 🙂 …why did I decide to read comments?! Try this puzzle. What part of your message is doubly in congruent despite your tracking software? haha, I’ll let my mind mull that one for a while … over a mulled wine or two. Double in-congruent suggests it’s congruent. Congruency DESPITE the tracking software???? Rephrased: What parts contradict? There are two separate instances.. I find myself overlooking the obvious all the time. I read what I meant instead of what I typed. 2???? the one I see one could argue as ‘contradiction’ is ‘sticking with it’ and then saying “don’t stick with admiring the stars”. If that’s what you mean, heck, I’m being judgemental, and I’ll say this: stick with something worth pursuing, something that actually makes the world a better place. Admiring stars isn’t one of them. Neither is developing a yet more refined iPhone (so people can waste their lives even more effectively). Developing cleaner energy, now we’re talking. if you don’t have a clear, concise call to action at the end of your content … people get lost and confused. where you also see the new plugin in action (it should be pretty obvious near the bottom;-), plus, the plugin ‘tells’ you about the upcoming “No Yuck Marketing” course. Would you like us to send you details on the workshops? IMHO you are smarter than the average bear and assume others are as intelligent as you. Where are the clear and concise links to both the plugin, and workshops notice optin. I’m guessing most folks will not post their interest but would readily click a link. Less friction = user friendly. Unless this was intentional to better qualify prospects for motivation. ah … well, now you’re weaving the email that led you to the post into it. as for the lost zombie-situation – yes, that’s intentional – if you’re not ‘fired up enough’ to type in the word ‘yes’ (or ‘no’) at the blinking cursor (granted, I could offer those as options e.g. to ‘tap on’ on a mobile), then probably not motivated enough. Gosh, I’m a genius, or I must play with triangles/pencils/ideas/philosophies all the time. This puzzle has been around since ancient egypt…or is that too great a clue? If you dont use muscles then they waste away…same as your creativity and learning to listen to one’s intuition and act upon it. wont always work the way you think it will but the more you try it the better you get. Thanks for making us think with your insights. As our thread progressed the Reply indents were cumulatively cutting off the the right-side text. Yes I WAS confused. I tried to insert my own cursor to type behind the blinking cursor. Thought is this just a demo or am I doing something wrong? When I get confused in a personal data input situation (sign up or purchase) I generally bounce. Quentin, one thing I didn’t mention in the ‘instruction video’ is that you can use subscriber names in the Chatbot – that way it perhaps gets past your “oh, it’s a Giphy” filter. but great feedback, and super-useful for designing these: start out with a super-short text, typed out quickly, then start the interaction. Thanks Veit, that’s a great idea (incidentally, the Reply box text font size is around 4pts and in light grey – certainly focuses the eyes 🙂 – being viewed on a Chromebook – the New Apple.